So before my mind spins out of control, let me make sure everyone is on the same page. As previously rumored, there will be an “Assassin’s Creed IV”. 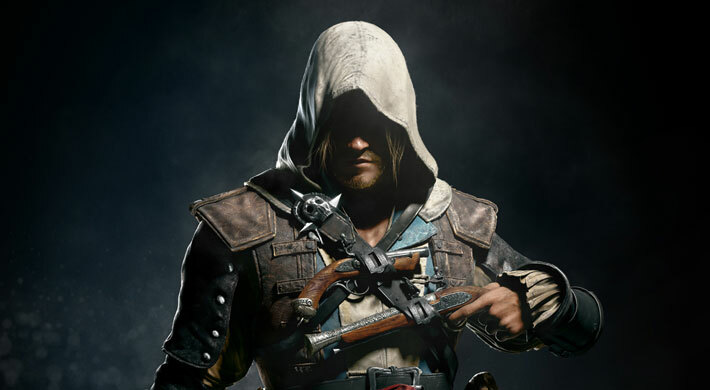 It is officially called “Assassin’s Creed IV: Black Flag,” and it sees you taking control of renowned pirate Captain Edward Kenway, who will be your assassin this evening. In it, you’ll wield up to four guns, captain your own ship (complete with upgrades), spend almost half of the game at sea, lead daring attacks on enemy ships, survive storms, engage in multiplayer, meet historical pirate figures, somehow “play as yourself” in the new modern day segments, harpoon whales (which PETA is already having issues with), and fulfill your land lover duties in cities ranging from pirate havens to Havana, Cuba and 50 overall various locations. One would assume you’ll also assassinate a templar or two, unless this series has decided that it’s now yo ho ho, a bottle of rum, and the pirates life for it. Now how is all of this, and more, known in roughly just 24 hours’ time? Because Ubisoft told us of course. They released the details, concept art, and even a trailer, which, in typical “Assassin’s Creed” fashion, is jaw dropping. Oh, and there is one other thing. It’s coming out this year. As in the 2013 calendar year. Ubisoft is insisting though that this is not a quick cash in attempt, and instead a true continuation of the series. You may have gathered this by that spiffy IV in the title, which sources tell me usually numerically follows the III seen in the previous “Assasin’s Creed” game, thus confirming Ubi’s claims,but the real evidence comes from the fact that Ubisoft has reported this game has been in development since 2011. Let’s go back to those numbers for a second shall we? “Assassin’s Creed III” came out in 2012, and “Assassin’s Creed IV” has been in development since 2011, also known as the same year “Assassin’s Creed: Revelations” came out. That’s three “Assassin’s Creed” games in 3 years, not counting mobile ports, two of which are claiming to be full fledged sequels, all of which were logically at some point in the works at the same time, which even if they were being handled by different staff and teams, is a hell of a lot of different manpower spread thin over a short period of time on one franchise. Something smells rotten here, and it’s not a case of scurvy. I wouldn’t normally be upset at this much “Assassin’s Creed” but, “Assassin’s Creed III” is only a handful of months old, and the promotional blitzkrieg of advertisements that preceded it, as well as the amazing sales figures that it resulted in is still very fresh. I also remember buying into the hype, and buying the game as well. What I especially can’t forget though is the distinct impression that I was playing half of a game. “Assassin’s Creed III” was filled with incomplete ideas and half assed execution to spare, chocking the life out of the things that made it genuinely impressive and creatively exciting. I remember the distinct feeling that I was playing a game that peaked early in the concept stages, and slacked off for the rest of its development time. For the life of me though, I couldn’t understand how it happened. It’s all a little clearer now though, and a hell of a lot more disturbing. “Assassin’s Creed III” didn’t feel like the game it should have been, and now we’re already gearing up for “Assassin’s Creed IV.” So what was “Assassin’s Creed III” then? Was it a preview of what was to come as the surprisingly expansive naval aspects suggested? Was it an enhanced spin off masquerading as a full-fledged sequel for higher sales figures? And what does that make “Assassin’s Creed IV”? Is it an apology? The true sequel all along? Or was it in fact originally the spinoff now taking the mantle as a sequel because it got the true development attention during all this time? I hate to have to ask these questions, but when you’re dealing with such questionable practices what else could there be? I’m left with nothing but questions as to why Ubisoft is releasing “Assassin’s Creed” installments like they are Madden titles. How can they release a clearly half finished “Assassin’s Creed III” and then expect everyone to keep a straight face while having to swallow a game that is at best an apology or the “real sequel”, and at worst a cash in attempt to milk both the massive user bases of the current gen consoles as well as attack the eager wallets of the soon to be early adopters of the next generation as well when this game hits PS4? Like I said, none of this would matter had “Assassin’s Creed III” felt like everything it could be, and a game that got the full attention it deserved. It didn’t in either case. So while, everything shown so far about “Assassin’s Creed IV” shows a great looking game, and is one that is certainly exciting based on early impressions alone, considering those were my exact feelings about “Assassin’s Creed III” , which only left me feeling half full, should I prepare to drop another $60 on “Assassin’s Creed IV” to chance filling that void? Nah. At this rate I’ll just wait for “Assassin’s Creed V”, no doubt under way now and scheduled for 2014.